St. Mary’s recently hosted College 101 Night where recent graduates came back for a panel-like discussion for our current students and their families. These alumni shared their stories and experiences on what life is like beyond the hallways of St. Mary’s. 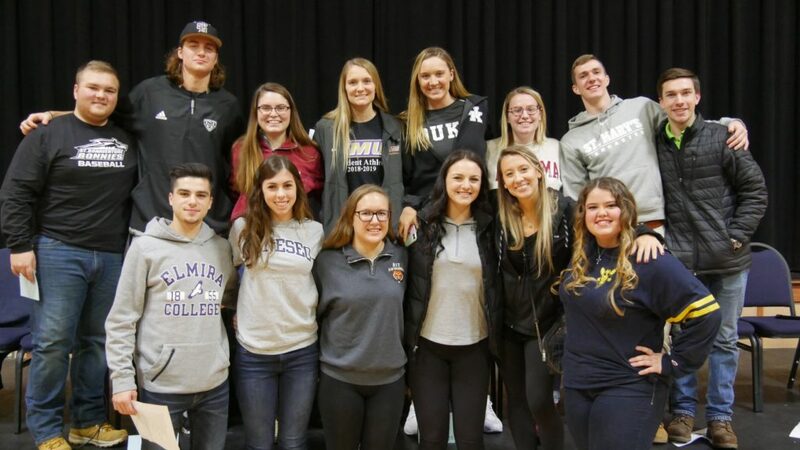 A special thanks to: Alyssa Zirnheld’16 from Mercyhurst University, Caitlyn Meyer ’17 from James Madison University, Carrie Kidder ’16 from Rochester Institute of Technology, Christian Szablewski ’18 and Mitch DiPirro ‘16 from St. Bonaventure University, Dani Hockwater ’15 from University at Buffalo, David Owczarczak ’16 from SUNY Erie Community College, Emily Bookmiller ’18 and Kendra Ciezki ’16 from The University of Alabama, Eric Brown ’18 and Shae Antonicelli ’18 from SUNY Geneseo, Leah Meyer ’15 from Duke University, Nino Marino ‘18 from Elmira College, and Shannon Murty ’18 from University of Rochester for coming back home to help our current bunch of Lancers!